France may have sat in the shadows of metal landmark bands – but it’s obvious that the success of Gojira changed that mindset over the past decade. 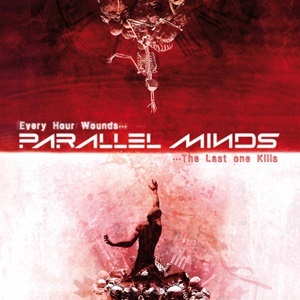 Parallel Minds aim to carve their own niche in the international groove/thrash landscape through their second album Every Hour Wounds…The Last One Kills. The conception of two musicians – vocalist Stéphane Fradet and guitarist Grégory Giraudo – they wanted to marry precision and aggression, musicianship with strength to incorporate a multi-dimensional, dynamic style. Bassist Antoine and drummer Eric Manella round out the lineup – so let’s hear what this follow-up to their Headlong Disaster debut from 2015 delivers over the course of the nine main tracks (our promo also contains two bonus tracks). It’s apparent early on that the group want to establish a foundation of hefty riffs that contain a bit of power/progressive sophistication, while at the same time keeping the rhythm section activities very propulsive and groove focused. You can hear both elements ping-pong from verse to bridge and back again on “Amerinds”, where everything from Megadeth and Symphony X to a bit of older Savatage come into play with exotic nuances, semi-intricate transitions, and heads down power rhythms when called for. The chugging, staccato-edge bursting from “I Am C” showcases their Pantera affinities, but yet again the musicianship transfers the energy into a bit of a power whirlwind, the vocals alternating between clean melodies and caustic screams. The 7:42 centerpiece “Syria” features a couple of guest vocalists with Kobi Farhi (Orphaned Land) and Yossi Sassi (ex-Orphaned Land), not surprising given the exotic and adventurous nature of the arrangement – jagged progressive riffs that occasionally streamline into melodic bliss, reminding me of early 90’s Psyco Drama meets Nevermore. Occasional missteps take place when the band try to go into funk metal land for “How” where the rapping verses appear awkward and uncomfortable, and there are other times where the cleaner, emotional vocal delivery isn’t as convincing as it could be during “On Your Own”. As bonus tracks for the digisleeve release, the band tackle “Tonight He Grins Again” from Savatage, and a shorter edit for “Syria” – it’s not easy to cover a quintessential act like Savatage, but Parallel Minds do their best to keep the dramatic elements at the forefront to execute a respectable tribute. Overall, Every Hour Wounds…The Last One Kills promotes a healthy cross-pollination of power, progressive and groove-oriented thrash metal songs that certainly puts Parallel Minds away from mere copycats, and that’s refreshing in a sea of imitators.